Irene Kharisma Sukandar is profiled in Forbes Indonesia's "10 Inspiring Women." 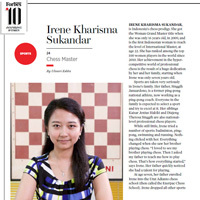 The accomplishments of the chess team continued to put Webster University in the news around the world, with its top female player being named to Forbes Indonesia's "10 Inspiring Women" while the team's fourth consecutive President's Cup ("Chess Final Four") collegiate championship received coverage across the United States. Irene Kharisma Sukandar is profiled in Forbes Indonesia for how she came to love chess as a young girl after watching her brother play. Sukandar's father is a former ping-pong national athlete himself. Sukandar has ranked among the top 100 women chess players in the world since 2010. She is pursuing her master's in International Relations and plans to pursue a PhD after graduating from Webster. The Boston Globe noted, "Webster University with its nine grandmasters and an average “A” team rating of 2734 is truly a force to be reckoned with in intercollegiate chess." A Washington Times story is headlined, "Define Chess Juggernaut: Webster rolls to 4th straight title." "In addition to serving as head coach of the Webster University chess team, Polgar is director of SPICE – the Susan Polgar Institute for Chess Excellence – at Webster. She and her husband, Paul Truong, who also is a champion chess player, run the SPICE program. Polgar also operates the Susan Polgar Foundation, a nonprofit organization geared toward promoting the educational benefits of chess for young people, especially girls. "In early March, she was focused primarily on prepping her Webster team for the upcoming collegiate matches to determine the Final Four winner. Polgar regularly studies the motivational techniques of successful coaches in other sports. Ever the competitor, she’s always looking for an edge." Read the full St. Louis Jewish Light story here.